What? The Japanese Pavilion which dominates Piccadilly Gardens. Its most defining feature is a large concrete wall which is sometimes described as the Berlin Wall of Manchester. Anyone stepping off a bus or tram is greeted by the brutal expanse of bland greyness, made even worse by rows of portable urinals. A pavilion should be a pleasant, relaxing place, though? The word 'pavilion' has connotations of pleasure and recreation, but Piccadilly Gardens isn’t exactly a place in which you want to hang around. The Japanese Pavilion is minimalist, cold and hardly welcoming - unless you’re gladdened by the sight of yet another Café Nero. When and who? The council set up an international competition to redesign the gardens as part of the regeneration that followed the IRA bomb. It also coincided with the smartening up of the city that happened in the run-up to the Commonwealth Games. The winners were announced in 1998, and Japanese professional boxer turned award-winning architect Tadao Ando was enlisted, completing the building in 2003. 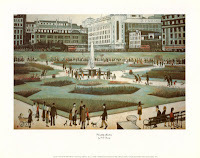 What was wrong with the old Piccadilly Gardens? The garden, which is the largest green open space in central Manchester, was created in 1914 where the basement of the original Manchester Royal Infirmary stood. By the time of the 1996 bomb, though, the sunken Victorian style ornamental gardens were seen as being both out of date and an unsafe no-go area populated by drug dealers. Now, all that remains of the original design are the statues, including the imposing figure of Queen Victoria. What’s Ando's track record? 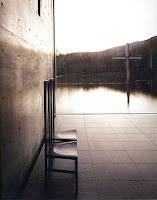 He's designed churches, art galleries and housing, which often incorporate natural elements such as light into the design – see the Church of Light in Japan or Church on the Water, which is surrounded by an artificial lake. The problem is, given the above average grey element of Manchester's skies, the greyness of the pavilion serves only to emphasise the prevalence of our overcast skies rather than distract from them, and the grubbiness of the wall is in keeping with the shabbiness of the gardens as a whole, with their patchy grass and litter. So it’s something to make Manchester proud? Let's take a look at another city, Sheffield, and what it's done to regenerate one of its public spaces. 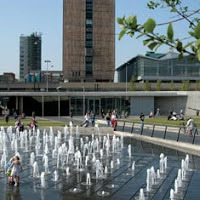 Visitors leaving Sheffield's train station walk out into Sheaf Square which, like Piccadilly Gardens, has fountains and a large wall. Sheffield's though, designed by international glass artist Keiko Mukadie, reflects (literally) the city's history. Cutting Edge is a five metres high, 90 metres long sculpture made of the steel for which the city is famous, and depicts the fashioning of a knife blade as a tribute to the city's reputation for fine cutlery. Finished in 2007, it has lights embedded in it and its mirror finish gleams and excites more than our bland concrete block. We drew the short straw, then? Yes. The Japanese Pavillion divides people – literally, as it's designed to separate the busy bus and Metrolink terminal from the rest of the space. Didn’t the council have ambitious plans for the Pavilion? Yes - in September 2007 it announced plans to create a living roof, and work was supposed to start this time last year. 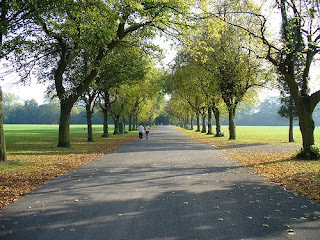 The council wanted to make Manchester Britain’s greenest city and attract wildlife to the area. The roof would have attracted birds and butterflies and come alive in summer. But it would only have been seen from offices that overlook the Pavilion anyway. That’s the main problem, isn’t it - the Pavilion is bit lifeless, especially compared to the hub of activity that goes on around it? The word on the street is that people would like to feel a bit more involved in the space. But at least people are trying to enliven the place - in April 2006, Manchester International Arts covered it in 25,000 pink, scented flowers as an installation called 'Wall Flowers'. And not very Manchester (there's a clue in the name)? No. Rachael Elwell of art knitting group ArtYarn says its “bleak” and “uninspiring” appearance is “a complete contradiction to what Manchester claims to achieve artistically”. She suggests a knitted panel covering the wall to bring back memories of “forgotten practises and ways of old living” from Manchester’s textile heritage. What else do you suggest we do about it? 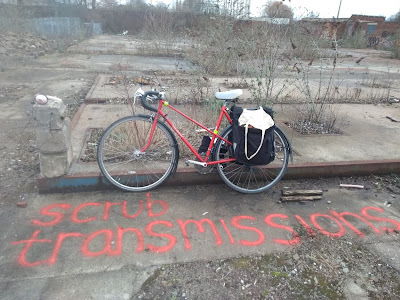 We could have a mural, stick with the fairy lights that are there at Christmas and at least bestow the Pavilion with a little bit of warmth, or even have changing projections on the wall. It could be given to graffiti artists like the street art walls down the road in Stevenson Square, or provide a new home for the Afflecks Palace mosaics. Sally Makison, an interior designer at Maddocks Design Partnership, thinks the tourist information centre should be moved from the town hall to a more central location inside the Pavilion. As a Victorian city, how about updating a Victorian leisure tradition that's a welcome addition to any park and turning the pavilion into a bandstand? Offer city centre buskers, who provide one of the last remaining shreds of individuality amid the chain stores of Market Street, rotating slots in a rain and wind free environment, and give people a reason to stay in Piccadilly Gardens rather than rushing though it. For many music fans, especially angsty teenagers, the miserablist group and Manchester are synonymous. Here's a guide how to find them in the streets around you. The artist more commonly known as Morrissey, who was born Stephen Patrick Morrissey in Davyhulme in 1959, will be returning to the city in 2009 to play two sold-out dates at the Apollo. A concert on 22 May will mark the fiftieth birthday of the man who has sound tracked the lives of generations, first as frontman of the Smiths and then as a distinctive performer in his own right. 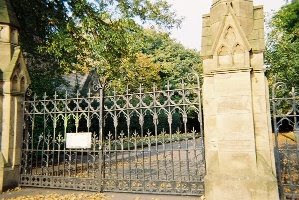 The Smiths' lyrics may be awash with references to areas of Manchester and its history, but Morrissey hasn't actually called the city home for a while. The bequiffed one left to live in the sunnier climes of first Los Angeles, and then Rome, over a decade ago. The remaining Smiths still contribute a visible presence to Manchester's musical landscape, though, and the band's legacy lives on in the city, not least in the Star and Garter's monthly Morrissey and Smiths disco, which caters for both those old enough to have been there from the start and teenagers young enough to have not been born yet when the Smiths split up. 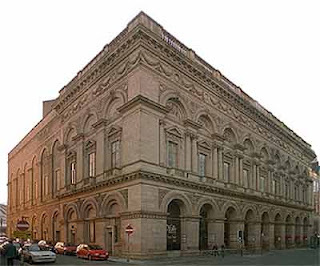 This guide will trace the history of one of Manchester's most famous musical exports, which also roughly coincides with some key events and places in the development of Manchester. 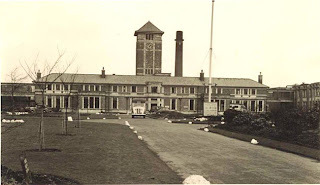 When Anuerin Bevan symbolically handed over the keys to this hospital in 1958, it marked the start of the NHS and free healthcare. Eleven years later, Morrissey, the man who would go on to change the course of popular music (at least in cult circles), was born in the hospital. 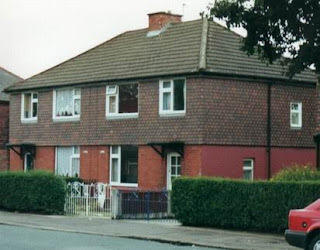 Morrissey spent his first six years in Hulme before his family relocated to Stretford during a slum-clearance scheme. This unassuming semi was where the momentous f irst meeting between unemployed writer Morrissey and guitarist Johnny Marr took place in 1982, the culmination of Marr's search for a singer and lyricist to match his distinctly crisp Rickenbacker sound. It went on to be one of the great rock partnerships, although not always a happy one. Johnny Rogan's dense tome Morrissey and Marr: The Severed Alliance is recommended for more reading on this well-documented topic. Morrissey has since gone on to have a lucrative solo career, collaborating with established artists such as Nancy Sinatra. Marr is still at the forefront of new music, appearing on records by both the American band Modest Mouse and the Cribs in recent years. Mike Joyce went on to play drums on Julian Cope's acclaimed album Peggy Suicide, as well as joining punk groups the Buzzcocks and Public Image Limited and touring with Sinead O'Connor. The Smiths' bassist, Andy Rourke, is now a DJ on XFM. 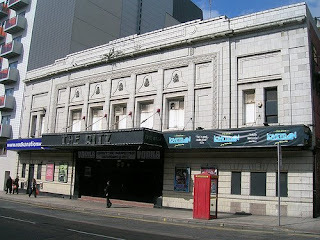 One of Manchester's major gig venues, the Ritz holds over 1,000 people, which is a scary proposition for any band's first gig. The Smiths made their debut here supporting the decidedly less catchily named Blue Rondo A La Turk on 4 October 1982. With a name like that, taken from a jazz tune by the Dave Brubeck Quintet, it's no wonder The Smiths made it big and Blue Rondo A La Turk seem to have been forgotten in the mists of musical history. To dwell on the name a moment, it's been suggested The Smiths was chosen as it sounds quintessentially, ordinarily English (which is ironic, as all of the band were of Irish descent). Last year, Whitworth Street West gained a new Smiths association: Mike Joyce now hosts a weekly club night at the Brickhouse venue just across the road from the Ritz, named AlternativeTherapy after a popular Revolution radio programme he used to present. Manchester was a very different place when the Smiths were recording. 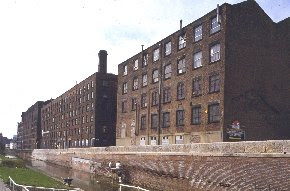 The old mill area and birthplace of the industrial revolution is all about regeneration and expensive flats now, but in the 1980s it was a symbol of Manchester's decay. Morrissey may be famous for his moroseness, but at least he had a sense of humour: backing vocals on the tune Bigmouth Strikes Again from The Smiths' 1986 album The Queen Is Dead are attributed to Ann Coates, but are really just Morrissey's voice speeded up. 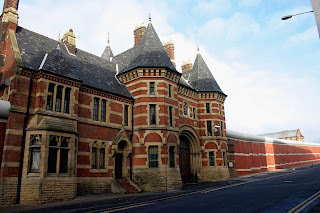 Although it's not officially been called Strangeways for years, HM Manchester Prison is still known by the name it lent to Strangeways Here We Come, the Smiths' final studio album, which was released in 1987. Morrissey's lyrics are often preoccupied with the city's most notorious criminals, notably the Moors Murders on Suffer Little Children from the band's eponymous first album. The Smiths' song Rusholme Ruffians, which is found on their 1985 album Meat is Murder, made the titular phrase famous, as well as the funfair that still takes place there. Morrissey's lyrics often focus on the mundane and everyday aspects of life, and the words to Rusholme Ruffians are typically bleak: by the big wheel generator on the last night of the fair, “a boy is stabbed and his money is grabbed and the air hangs heavy like a dulling wine”. Incidentally, Rusholme is situated in south Manchester student heartland, which might well boast the highest concentration of Smiths fans in the city. This redbrick social club is often the first port of call for many visiting Smiths fans, because it features on the inner sleeve of the iconic Smiths' album The Queen is Dead. It now has a Smiths room dedicated to the band. At the time, however, the club's committee were unhappy with its association with the group, fearing Morrissey's lyrics would lead young boys astray. Two decades on, it seems the band have been embraced by the establishment. 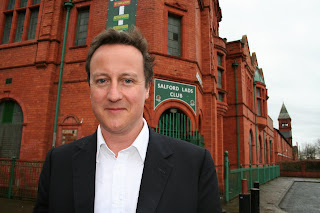 After revealing a fondness for the Smiths, Conservative leader David Cameron attempted to pose outside the club on a visit to Manchester last year. He was thwarted by local Labour MP Hazel Blears and protesters bearing placards saying 'Salford Lads not Eton Snobs' and 'Oi! Dave - Eton lads' is 300 miles'. Determined Dave got his picture in the end, even though a gloating Blears assured him “Not on my watch you won't, Dave” after an unsuccessful first attempt. The club has been cash-stricken in recent years, and has benefited from Smiths-related fund raising activities aiming to get together money for repairs. 9: Southern Cemetery, Barlow Moor Road Morrissey's bookish nature is evident on Cemetery Gates, from The Queen Is Dead, which takes place on a “dreaded sunny day” in Southern cemetery and name checks Keats, Yates and Wilde. Morrissey often borrowed phrases from films, books and plays, including Shenagh Delaney's Salford play A Taste of Honey. Pretty Girls Make Graves, from the Smiths' self-titled debut album, is a line from Beat author Jack Kerouac's novel The Dharma Bums. Morrissey's lyrics in turn went on to influence popular culture worldwide, a cult American punk band that formed in 2001 taking the song title Pretty Girls Make Graves as their name. Likewise Canadian author Douglas Coupland named a book Girlfriend In a Coma in tribute to the Smiths song of the same title. The Smiths played at the site of the Peterloo Massacre twice, the first time in 1984 whilst promoting their debut album. It's here that the Smiths story comes to an end - their last ever Manchester gig was held at the Free Trade Hall in October 1986.